Approaches developed at the UW Institute of Protein Design might help researchers in the design of midsize drug compounds. 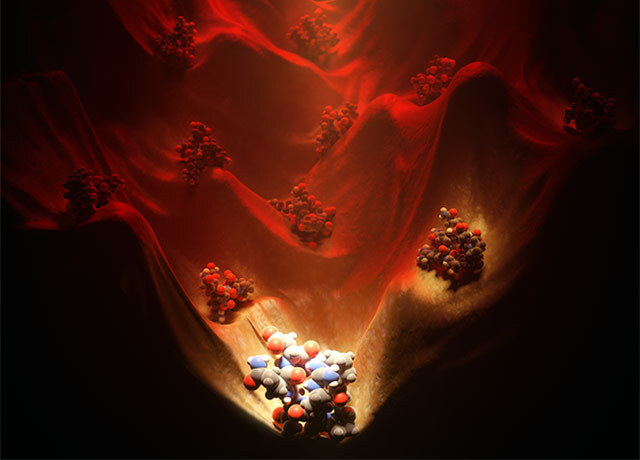 This conceptual art "Illuminating the energy landscape" shows the power of computational design to explore and illuminate structured peptides across the vast energy landscape. Macrocyclic peptides have sparked pharmaceutical industry interest, because they have certain physical and chemical properties that could become the basis of a new generation of medications. Peptides are similar to protein molecules, but differ in their smaller size, structure and functions. An example of a macrocyclic peptide drug success story is cyclosporine, used as an immunosuppressant for organ transplants and some autoimmune disorders. Naturally occurring peptides that might serve as reliable starting points, or scaffolds, are few. Equally as frustrating is that they often fail to perform as expected when repurposed. Instead, researchers had resorted to screening through large, randomly generated libraries of compounds in the hopes of finding what they needed. The lead authors are Parisa Hossienzadeh, Gaurav Bhardwaj and Vikram Mulligan, of the University of Washington School of Medicine Department of Biochemistry and the UW Institute for Protein Design. The senior author is David Baker, professor of biochemistry and head of the institute. Baker is also a Howard Hughes Medical Institute investigator. A conceptual illustration of sampling many peptide structures and selecting the best through their energy landscapes by Ahmad Hosseinzadeh and Khosro Khosravi. Designing peptides takes intensive computer power, resulting in expensive calculations. The researchers credited a cadre of citizen scientists and volunteers who donated their spare cellular smartphone minutes and computer times. The Hyak Supercomputer at the University of Washington also ran some of the programs.